September 2016 (Part 1) - Fall Cooking-What about some Pears? We are delighted to have Kim Beavers on our team. We have asked her to share a little more about herself and share some fall cooking ideas over the next two weeks! 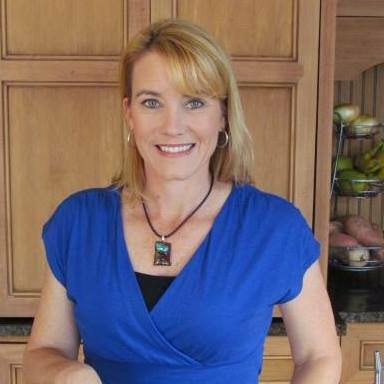 I am a registered dietitian and am delighted to be part of the team at Aiken-Augusta Holistic Health. I am originally from the great state of Virginia, and got both my undergraduate and graduate degree from James Madison University. I moved to the CSRA for a job and met my husband, and the rest they say is – history. For the past ten years I have been and continue to be the producer and co-host of University Health Care System’s culinary nutrition segment Eating Well with Kim which airs on WRDW. My nutrition philosophy is that food can and should be both health promoting and delicious. Eating well helps me to enjoy an active lifestyle with my husband, children and dogs. I wish the same for you. Please enjoy one of my favorite salad recipes! Food plays a significant role in health and it should be enjoyed! Berries are the nutritional powerhouses of the fruit world, but today I’d like to show the lowly pear a little love. Pears are impressive for their fiber content: one medium pear has 6 grams of fiber, in addition they are a good source of vitamin C, and they are juicy and delicious when perfectly ripe. However knowing when pears are ripe is a little on the tricky side. Pears resemble avocados….there is a perfect level of ripeness in which to eat them and then there are less perfect times of ripeness when you wish you had either eaten them earlier or waited just a little longer to eat them. Pears do not actually ripen on the tree, they are harvested when mature but not fully ripe, left at room temperature they will slowly reach sweet, juicy maturity as they ripen from the inside out. The best way to tell if a pear is ripe is to push on the neck of your pear by applying gentle pressure to the neck, or stem end, of the pear with your thumb. If it yields to pressure, then it’s ripe and ready to eat! Once the pear is ripe, it can be refrigerated to slow the ripening process and saved for use up to five days. May you forever more enjoy deliciously ripe pears! Just add grilled chicken or fish and you have the perfect fall outdoor eating experience. Combine the olive oil, vinegar, honey or agave, salt and pepper in a small bowl and whisk vigorously. Add the chopped pear and coat (to help avoid browning). When ready to serve remove the pears from the dressing with a slotted spoon. Toss the salad dressing with the salad greens and evenly distribute onto each of 4 plates and top with the pears, red onion, and pepitas. Nutrition Breakdown: Calories 180, Fat 12g (2g saturated), Cholesterol 0mg, Carbohydrate 14g, Fiber 3g, Protein 4g, Potassium 90g. Note: To make the pickled red onion: slice a large red onion into the shape that you like and place in a colander and pour boiling hot water over the onion. In a separate bowl combine ~3 tablespoons cider vinegar with 1-2 teaspoons agave nectar and ~ ¼ teaspoon salt. Toss the drained onions with the cider mix and let it sit for several hours in the refrigerator. Store in the refrigerator and use over grilled meat, on sandwiches or on salad as I have done here. This recipe came from The Heart of the Plate cookbook by Mollie Katzen. I highly recommend the recipe and the book!